A question that we get a lot is: “Can I get strong and conditioned at the same time?” When I was younger, I would have said absolutely not. When I was a powerlifter, conditioning was a set of ten on squats. I increased work capacity through more and more work in the weight room. Obviously it worked, but is there a better way? Better yet, is there a healthier way? In the last year, I have studied, tested, and developed some cool ways to get strong and in great shape. I have to admit that my man Chris “Ox” Mason came up with the concept that I am about to present. I started working out with him earlier this year to get out of my slump that I slipped into during 2016. Ox is my old training partner from college all the way into my professional powerlifting days. Training with him again was like taking things back for me back to a place where I fell in love with training. I developed our strength portion, and he developed our conditioning portion. Today I am talking about how we mixed the two. I have enjoyed these workouts probably more than any other workouts ever. I have recovered better, experienced less chronic pain, gotten way stronger, and way more conditioned. Volume: 3-4 sets of 30 second of each movement with 1-3 minutes rest between rounds. We also did 3 sets of Tabata while changing exercises each tabata. Let’s go through some of the principles. First the low eccentric and low impact strength piece is something that Louie Simmons has been preaching for years, so no one can say that they made this up. So what do I mean by low eccentric? I am talking about movements that are either concentric or isometric in nature. That means you are picking movements that are only loading the muscles during their shortening (ex. Ascent of a Back Squat or a Bench Press), or when the length isn’t changing at all (a heavy carry or pressing against a wall). The low impact refers to the fact that the movements aren’t putting undue pressure on any major joints. Some examples of low eccentric and low impact movements are: farmers walk, zercher carries, heavy bag carries, sled pushes, sled drags, rope pulls, and overhead carries. Sleds are great for increasing your heart rate, conditioning and strengthening the hips. The carries are the best way to strengthen the core. 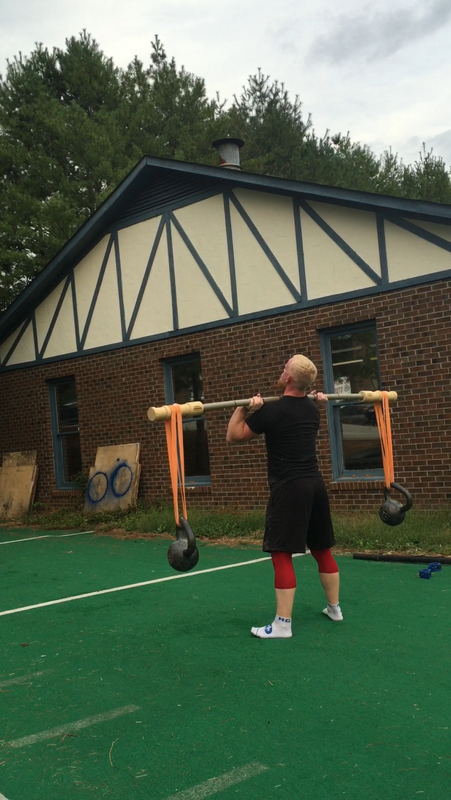 Overhead Carries (my favorite) are great for overhead stability and the entire kinetic chain. We normally throw in overhead carries because I have some neuromuscular damage in my left arm, so we are trying to wake up those pathways. I have noticed some major improvements during the last few months regarding position, endurance, and load. The mobility movements are designed to target our trouble areas in my case the hips. The movements are also designed to keep us moving. We want to keep the heart rate up for some cardiovascular improvements. There is one benefit from this style of training that means the most to me. I have some major hip damage in my right hip. It’s very arthritic, and it hurt all the time in the past. I was getting a cortisone shot almost every three months, and I was taking way too many NSAIDs. I haven’t had a cortisone shot since June of last year. That’s a record for me over the last five years. I am also sleeping better. I am convinced that this style of training would have allowed me when I was younger to train a lot longer without getting so beat up. The added volume is helping to strengthen my joints as well. I may or may not compete again, but I will use this style of conditioning forever. It’s fun, easily quantified, and leaves you feeling better. That’s the best part. You will leave the gym feeling better than ever making the rest of your day brighter. It really is endless. I see this style of conditioning working for the masses. I am excited to work with Coach Ox on perfecting this style of training, and offering it more clearly to all of you. At the end of the day, I just want to impact lives in a positive way. I hope that is everyone’s goal.